Minister Niedrigh is torturing Booster Gold for information on the Legion. Booster isn't very cooperative, but unfortunately Skeets didn't really have a choice and both Booster and Skeets are scheduled for "re-purposing." Meanwhile, the Legion are preparing for an impossible battle in which neither side - New Krypton or EarthGov - wants but both likely needs the Legion's help. The assembled Legionnaires renew their oaths both to the Legion and to "preserve life at all costs." Also meanwhile, Brainiac has discovered that the Earth spies seen previously planted an ancient technology on the Worldship New Krypton that will "put simply... let them win." As the Kryptonians prepare to launch their gravity bomb, a "spatial distortion" causes energy begins to spoke across the Worldship, and the war has begun. Back in the Amazon, Supergirl retrieves for questioning one of the EarthGov agents that Superman trapped with his Arctic breath last issue. 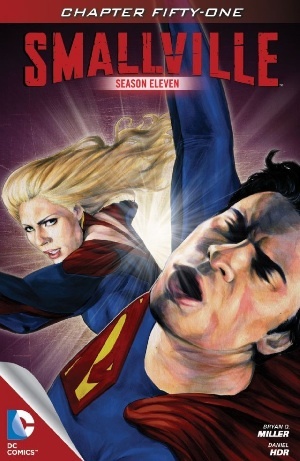 She seems poised to kill him with her heat vision when Superman intervenes. They fight and Superman calms her with promises of how he has a better way and will make everything all right. Just then, Brainiac alerts them both of a developing situation. New Krypton, about to launch its assault on Earth, is being attacked by Doomsday. Story - 3: It's so heartwarming when the heroes fight each other, isn't it? It reinforces the idea that you have to have FIGHTINGTM in every super-hero story, for one, which we love - bring on the wrestle mania (! ); plus, it makes oodles and oodles of sense! Except that, see, most of the time in fiction battles convey a transfer or power, whether of a literally physical kind (in the least interesting instances) or some other, deeper kind of power. But it's done in a way that exposes a weakness in the broader narrative, beginning with the show. Here between Clark and Kara, I'd say we're supposed to be witness to a transfer of wisdom - what stops the fight is Clark's articulation of his ethos, not his exertion of physical power. This is appropriate, since their struggle comes down to divergent perspectives on both the relative sanctity of life and the use of force. Except that's exactly what defined their dynamic on the show, such that in addition to transferring the power of Clark's wisdom it also shows that Kara is still a petulant firebrand who evidently didn't learn much of anything from Clark the first time 'round, thus robbing this moment of its due weight. She says she lost her temper, I'd say that's a convenient understatement. Furthermore, this exchange underscores one of the essential problems of Smallville - that having Clark defeat so many villains and meet so many heroes before he actually becomes Superman consigns him to a future - more literally than ever here in "Argo" - where he has to teach the same lessons over and over again. Otherwise, this chapter is ok. It's not really all that clear what Niedrigh wants with Booster; the photostatic sequence with the EarthGov dudes trapped in ice is cute; and the Legion moments sufficiently highlight the life or death stakes at the center of the story's principal conflict in a way that also reinforces Superman's philosophy in his FIGHTTM with Kara. But it isn't really clear what the ancient technology is (it looks like a first-generation Blackberry Storm, which I had and knew from day one that there was no way it would last 1,000 years) and it ends in pretty much the same way as the last chapter, with a Doomsday reveal. At least here the threat he poses his palpable. Art - 3: Pretty good work with the pencils, though as seems to be a regular feature of this title, fidelity of individual character's likenesses (not even to the show's cast but just to themselves) is weak from panel to panel and wide-angle panels in general suffer from a lack of detail. I'd be pretty disappointed with this work if it was in one of the monthlies. Cover Art - 3: Big fan right here of the color work on this cover, though the composition is bland and the fact that this is the scene chosen for three weeks' worth of covers is more than a little depressing. Forcing the heroes to fight is a tired and stupid super-hero convention. I get a "Fightin' Fanboys" thing in my RSS feeds from Marvel once a week or month or something, wherein they publish interviews etc. with "professional" wrestlers from the WWE or whatever discussing the Marvel Universe. DC does no such thing that I am aware of, and I like it that way.